4 inch german pattern Nautical Sextant with wooden box on glass print. C-Plath Humburg 8054 8 inch sextant with wooden box. its made of brass & fully workable with antqiue finish. its weigtht is 2.25 kg . its sextant telescope is come out in sextant. 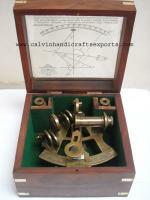 Inch German Pattern Sextant with Wooden Box Its Made of Brass & Fully Workable with Antqiue Finish Its Weigtht is 2.10 Kg.